Pet sympathy cards are a growing trend and it’s one we approve of whole-heartedly. When someone loses a pet, it can be difficult to cope with the loss of a companion who has been with them for years. When friends and relatives fail to understand the depth of your grief or try to minimize your pain with platitudes like, “But it was only a cat, you can get another one,” it’s even harder to grieve. In recent years, however, some card manufacturers have recognized that mourning a beloved animal requires the same kind of ritual and kindness that losing a person receives. Animal sympathy cards have found their way onto the shelves of card shops, pharmacies and online stores. The original pet sympathy cards were fairly plain and straight-forward. They tended to be “bargain basement” styles and said simply, “In the Loss of Your Pet,’ with an appropriate platitude on the inside. 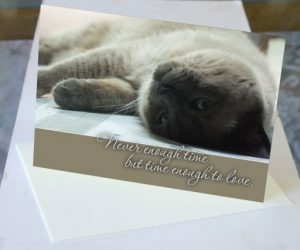 With the rise in popularity of these cards and the increased need for them, artists and designers are now creating beautiful pet sympathy cards that include images from fine art paintings or photographs and lovely verses and quotes about pets and their loss. Bernadette Kazmarski, an artist, writer and pet lover, creates some of the most beautiful and touching animal sympathy card we’ve seen. Her pastels, photographs and paintings all features lovely renditions of her own pets or pets she knows well. The verses and messages are comforting and warm. They’re the equivalent of the sympathetic embrace of a friend or loved one. It’s not surprising that Kazmarski’s cards are beautiful – she’s an artist and writer. Crafting everything from the artwork to the sentiments on the cards is a natural extension of her talents. She also does artwork with cat images ranging from trinket dishes to picture frames. You can see examples of her work at The Creative Cat. Bernadette focuses on capturing the very real sense of loss that pet owners feel when they’ve lost a faithful companion and acknowledges how difficult it can be while offering hope and support. But her website isn’t just about her sympathy cards. She also blogs about everything from feline rescue groups to creating a backyard habitat this is cat friendly. If you visit the Creative Cat website, you’ll read or see something different every day. 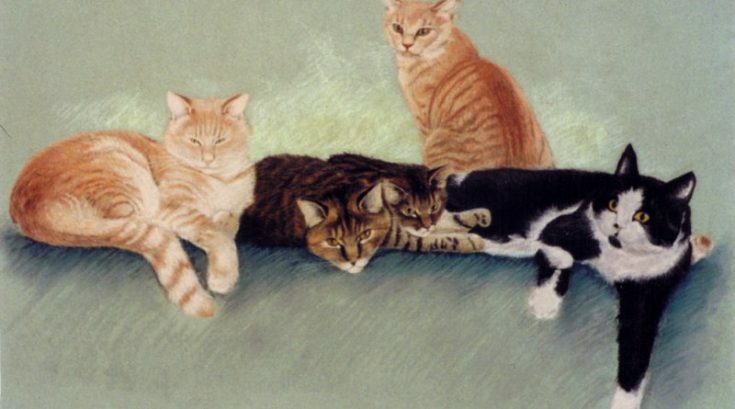 She also does fine art paintings, pencil sketches and line drawings of cats and other animals. These can also be beautiful gifts for someone who has recently lost a feline companion or who is celebrating the adoption of a pet. Thank you so much for featuring my sympathy cards, and it was wonderful to meet you! This is a very nice idea to have for a pet loss. Such cards can truly express your condolences to the pet owners. I would definitely try this one. Yes, grieving over the loss of a pet can be just as painful as grieving over the loss of a friend. Acknowledging the loss of a pet with a card, flowers or some other gesture can let someone know that you truly understand the magnitude of their loss. I always capture a picture in my pet so that if they will pass away I have a remembrance. For sympathy cards, I used canva in making a memory for my pet.